Geelong Cricket Club bounced back from its disappointing pre-Christmas loss in the best way possible, with a stirring win against top-placed Fitzroy Doncaster last Saturday. The Cats lost the toss and bowled first, and found the early going tough as their hosts cruised to 1/128 midway through their innings. The bowling group dug deep though, led by Jake Reed (3/45) and Brenton McDonald (2/34), they fought back brilliantly to restrict the score to 9/201. In reply, it was another shaky start, with the top order under pressure at 2/48. But from there, it was all Geelong, as Tim Ludeman (93) combined with Hayden Butterworth (75*) for a magnificent match-winning partnership of 140 to see their team home by 7 wickets with 11 overs to spare. The win sees Geelong move to sixth place on the ladder, and with a very winnable one-day game on Saturday against bottom side Kingston Hawthorn, should be looking to move even higher up the table. Geelong Cricket Association will hold its last one-day round of this season’s fixture on Saturday. 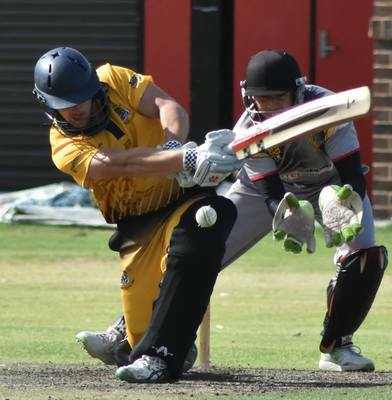 In division one, the two sides sitting just outside the top four, South Barwon in fifth and Lara in sixth, played an absolute nail-biter last week, with South Barwon eventually winning by one run. Phil Lang (49) and Jack Spence (40) top scored in the Swans total of 8/183, while Joel Davies (3/39) was the star with the ball as Lara fell agonisingly short, bowled out for 182 in the last over. For Lara, Andy Hughes continues to be their standout player, top-scoring with 70, but as usual, he had little help. Both sides are fighting for their finals chances this week, firstly South Barwon will travel to Queens Park to take on second-placed Newtown & Chilwell. While Lara will host a resurgent St Josephs, who have found a rich vein of form and moved up to third on the ladder, showing they are a sneaky chance of doing some damage in the finals if they can hold their spot. In division two, Marshall’s season may well be on the line when they travel to Hamlyn Reserve to play Bell Park on Saturday. The Bears simply haven’t been consistent enough this season, with four wins and four losses showing they deserve their spot in the middle of the table. But Bell Park hasn’t been the force it has been in previous seasons, and find themselves in third place courtesy of a fortunate outright win against Manifold Heights. Both sides have been relying heavily on their stars too much, and really need a more even contribution if they are to go all the way this season. But, if either side can manage to achieve that, they will be right in the hunt for the flag. Selections in bold: ST PETERS v Manifold Heights, BELL PARK v Marshall, MURGHEBOLUC v Thomson, TORQUAY v Highton. And in division three, Alexander Thomson’s defeat of Newcomb & District last week looks like it has reduced the race for the flag down to six teams. The most intriguing game this week looks to be out at Don Wallace Reserve where fifth placed Teesdale host St Albans Breakwater who sit in third. Both teams have been struggling for form of late, Teesdale winning just one of their past three games, while St Albans Breakwater have won none of their last three. It’s time to stand up now though, as the race for a finals spot is heating up, and a loss to either side here could really come back to bite them in the long run. Selections in bold: TEESDALE v St Albans Breakwater, Newcomb & DSistrict v GEELONG WEST, Guild Saints v ALEXANDER THOMSON, MODEWARRE v Waurn Ponds-Deakin, BANNOCKBURN v Corio.